A couple weeks ago, I asked a friend what the point of SETI was if we were not sending messages ourselves. How can we expect other civilizations to be sending things we can find if we aren’t willing to do it? I think my initial conjecture has several reasonable responses that were not initially clear to me, including that if ETI does exist, I highly doubt they will have motivations we can sufficiently understand to reliably predict their behavior, especially based on our own. In a Statement Regarding METI (Messaging Extra Terrestrial Intelligence), scientists at Berkeley running the world’s leading SETI program declare a stern condemnation of METI efforts, mostly by employing logical arguments directly against several common METI sentiments. Sharing sentiments similar to other leading minds like Carl Sagan, Stephen Hawking, and Sean Carroll*, they argue that we cannot understand how ETI (who are statistically certain to be much more technologically advanced) will react to our message. Apparently, a common argument for METI is that SETI obviously hasn’t found anything yet, so we need to try other methods. Maybe we are so used to seeing rapid (decade-timescale) progress in our scientific fields that it feels like SETI not finding anything means that they are doing something inherently wrong. SETI is peculiar as a field in that, at some level, no matter how many resources we throw at it (not that we have been throwing much at it), we could still find absolutely nothing. And that would be progress! It feels like a fundamental misunderstanding to say that we haven’t been listening well, so have to try talking. Also, the argument that sufficiently advanced ETI would have already seen our early radio emissions, or atmospheric so METI wouldn’t make anything worse is a peculiar point to try to stand behind, considering it seems to invalidate the need for METI at all. Interestingly their final argument is very political in that they do not want METI to cause dissension in the ranks of SETI leading to a future lack of funding. It is illustrative to see such a point spelled out so directly and publicly. *Serious side note, no matter how many famous people believe something, that does not mean that you should blindly agree with them #bandwagon. It is important to remember that your thoughts and conclusions should be your own, especially when trying to convince others. This personally reminds me of Christmas sweaters, nonograms, or the early Atari games, but there is meaning to it. 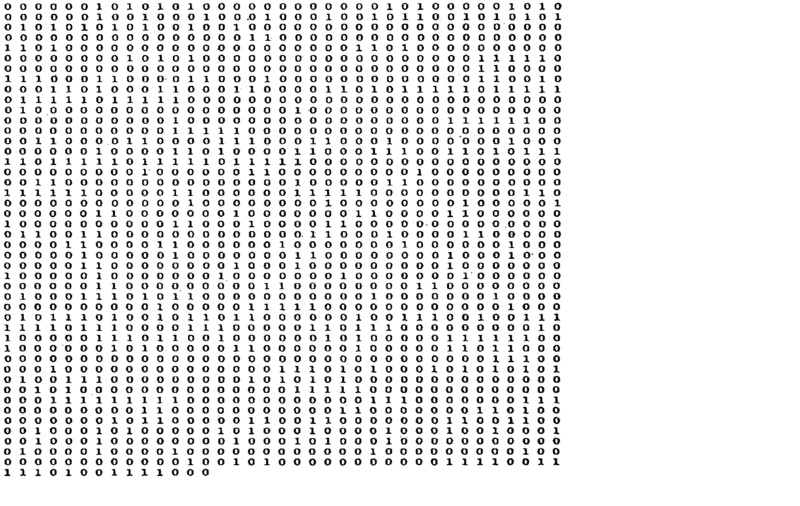 The first line indicates the numbers 1 through 10 in binary. Apparently the numbers 8, 9, and 10 are too large, so they are written differently? I’m not sure I really understand that even with a decent explanation from the authors, which makes me believe that anyone trying to decipher this would have an even more difficult time (I suppose they could just be remarkably more clever than I). After these numbers, there is a “description of fundamental terrestrial biochemistry.” Although I can pretend to see the 1-10 numbers, I have no idea where they biochemistry stuff is (apparently lines 12-30). First comes the numbers 1, 6, 7, 8, and 15, indicated the elements H, C, N, O, and P. These elements are required for life as we know it (although some might argue the importance of other elements). After these numbers are chemical formulae of molecules or radicals (the paper doesn’t say which ones). Included in here are the structures of the molecules that make up DNA, in the structure of a double helix, and the number 4 billion to indicate the number of molecular pairs (adenine-thymine or guanine-cytosine) in DNA in a single chromosome. Below all this is a representation of a human! We are bipedal with arms and a head. This comes with the number 14, indicated that the human is about 14 units tall. The units are (apparently obviously) the wavelength of the original transmission. Below the human is a schematic of the solar system; the big blob is the Sun, then all nine [at the time] planets. The length of each bar is a semi- indication of the planetary size, and the third dot from the Sun is us! It is slightly placed out of plane, in an attempt to indicate that that planet is where humans reside. I would interpret it as the planet’s inclination, but that’s okay. Below our solar system is a drawing of Arecibo. I would never guess this, but that’s what it is. This drawing is accompanied by the size of the telescope, my guess is with the hope that any response would take into consideration our limitations and make sure that we could actually hear them. This message was put together by numerous people, and is quite creative to say the least. That being said, I am extremely doubtful that this message could be interpreted! For starters, the only way I could make heads or tales of it was from the picture directly, and that was after the whole 27-73 thing was implemented. But what if the receivers only caught part of the transmission? It took 169 seconds to send, so it is possible that only a minute or less would be received if the receiver was not pointed at Earth for the entirety of the message. With only part of the message, there is nothing to indicate where each line starts or how long it should be. In addition to all this, it would take a lot of brain power to decipher all of it. Sure, some of it could be understood without much time, but to get all of the message would take work and prior knowledge. This all assumes that whomever receives this thinks in a way similar to how we do, and what is to say that they way we think is normal? What’s to say that clearly it is logical that the first line is just numbers, and then straight from numbers we switch to chemistry? I do wonder, assuming that the recipient of this deciphered it, what the odds are for misinterpretation, and what the consequences of this would be. It would certainly be amusing (to read about, not to experience), if the compounds were interpreted as a cry for help, and some lovely civilization prepared them all and brought them to us in quantities large enough for our population (4 billion at the time). What if they thought that each of our chromosomes needed these compounds for each of the 4 billion people? Imagine an entire fleet of interstellar (or intergalactic) ships coming to our rescue in 50,000 years with buckets and buckets full of thymine (I don’t think you can just store that in a bucket). I also wonder if a group of humans could decipher this. If we just gave this message in binary (we could also just send it via radio, but I’m not sure that would be picked up) to a group of intelligent, multi-disciplinary people, would they be able to pull out all of this information? This seems like an important sanity check (to me) for any METI that we do end up sending out. If we humans can’t decipher our own messages, with the culture and knowledge that went into its making, then why would anyone else out there be able to decipher it? With all this being said, I should note that the people who sent this message did not really expect it to be received or answered, that this was just a proof of concept of the current technological capabilities. So whether or not this message is received, understood, correctly interpreted, or responded to isn’t all that important. 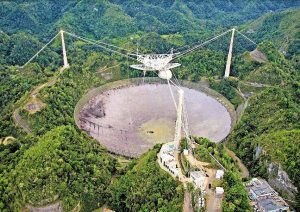 Arecibo 1974 – Interstellar telegram or PR gimmick? In this article I shall delve into whether Message Extra-Terrestrial Intelligence (METI) is a smart idea or not. I seek to discuss and question whether the message broadcasted by Arecibo in 1974 was meant to reach out to another civilization, or was it just a PR gimmick? 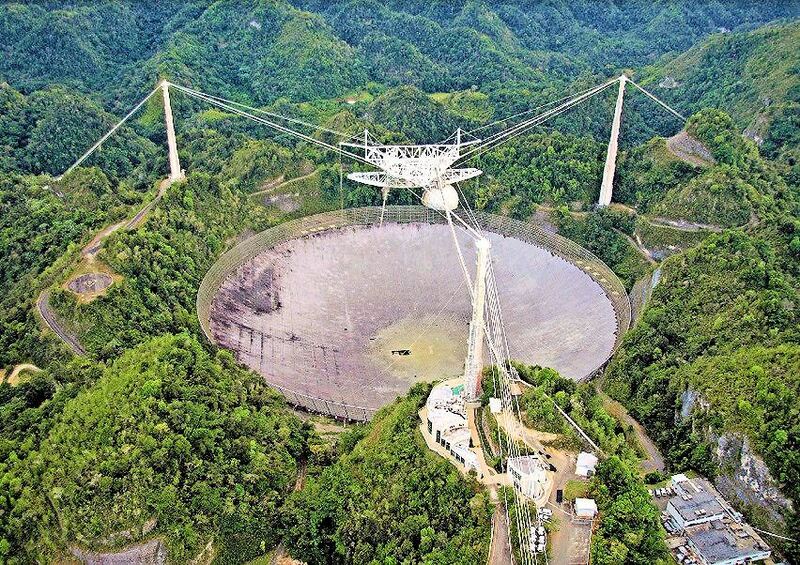 The Arecibo Observatory, in Puerto Rico (USA) is a 305 m (1000 ft) radio telescope. It is the most powerful non military radio transmitter that mankind possesses. In 1974, it was used to broadcast a narrow-band signal ( ~ 10 MHz) at 2380 MHz towards the globular cluster Messier 13. M 13 is a globular cluster in the constellation of Hercules and is at a distance of about 22000 light years. Globular clusters are some of the oldest objects in the known Universe and hence harbour a stable host environment for an intelligent life form to develop, say as opposed to a Star Forming Region. The intensity of the transmitted signal was such, that is would outshine the Sun by a factor of 10 billion (10^7). The intensity, narrow-band and the prime number factors should be enough to clue in the listener to the signal’s artificial origin. A fact that can be further confirmed by the contents of the signal. Thus, it seems that the message was formulated and broadcasted to serve as an announcement of our place in the Universe. That being said, as has been clearly articulated at the end of NAIC STAFF, 1974: the target (why not M4, at one third the distance), the frequency (2380 MHz and not the waterhole frequency), and the duration of the message (only 169 seconds) clearly indicate that the message was not meant to initiate interstellar dialogue. Further they also mention that a serious attempt to initiate such a discourse should come from an international consensus of nations and not unilateral action. Rather I believe, that the broadcast was a technology demonstrator for the newly upgraded radio transmitter (funded by the National Science Foundation – NSF) . It was meant to garner public support towards funding scientific pursuit. Considering that it was not really meant as an attempt to initiate interstellar dialogue, is it justified to classify it along with METI (Messaging to ET intelligence) ? Gertz composes a compelling document in which he expounds upon the shortcomings and nearsightedness of the METI initiative. In summary, Gertz is condemning the proponents of METI and justifies his position very effectively. I have a strong positive reaction to this document for reasons that I will explain. In the section entitled “Someone has to be the first to transmit,” Gertz raises the point that METI-ists contend that civilizations would probably be much older than us, and therefore would have been transmitting early on. That they are not suggests that either they do not exist or again have some reason to not transmit. This reasoning is consistent with the second conclusion from above, and reading this called to my mind a novel that I read last year. Although suggesting a pattern of behavior is a sociological argument that fails on a universal level due to the requirement that every such civilization will have to remain radio-quiet for all time, there is some merit to consider it as a near term solution to the Fermi paradox. In the science fiction novel “The Dark Forest,” author Cixin Liu offers a hypothetical solution to the Fermi paradox on the sociological argument that all sufficiently realized intelligences will observe radio-silence. The argument is predicated on two basic “axioms” and observations. The two “axioms” are that 1) life will naturally seek to preserve itself, and 2) outward growth is a natural consequence of life. Then, the two observations are that 1) resources in the universe are finite, and 2) instantaneous communication is impossible. As far as physics is now understood, these assertions are sound. Therefore, applying these axioms and observations to the case of two nearby civilizations which have recently come into contact with one another, they can never know the other’s true intentions whether hostile or benevolent due to the constraint of time-delayed communication, what Liu calls the “chains of suspicion”. Therefore, they must prepare for the worst outcome and pre-emptively strike in order to ensure they preserve themselves and their future access to the other’s resources. While the suspicious behavior is somewhat anthropomorphic, many prominent scientists also hold similar beliefs. For every two seconds that pass without a return message, the “null sphere“ within which there probably do not exist any radio-capable intelligences increases in radius by one lightsecond. Therefore, METI to very nearby stars is probably a waste of effort for now because if conclusion 1) from above is true, then there aren’t any civilizations in the null sphere. And if conclusion 2) from above is true, then it would be in our best interest to remain quiet, at least until we understand why. 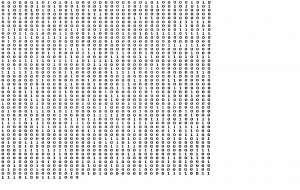 Though it seems METI is not the most productive activity for us for now, I feel more forgiving towards Frank Drake’s original Arecibo message in 1974 because of multiple reasons. Firstly, the protocols and understandings that we have arrived at with regards to such activities had not yet been developed. Secondly, the message was short in duration and not repeated, so that the probability that anyone actually receives it in the remote future is very low. And thirdly, and probably most importantly, M13 is some 22,000ly distant, so the very soonest that we can realize this as being a mistake is some 44,000 years from now, and probably much longer than that. 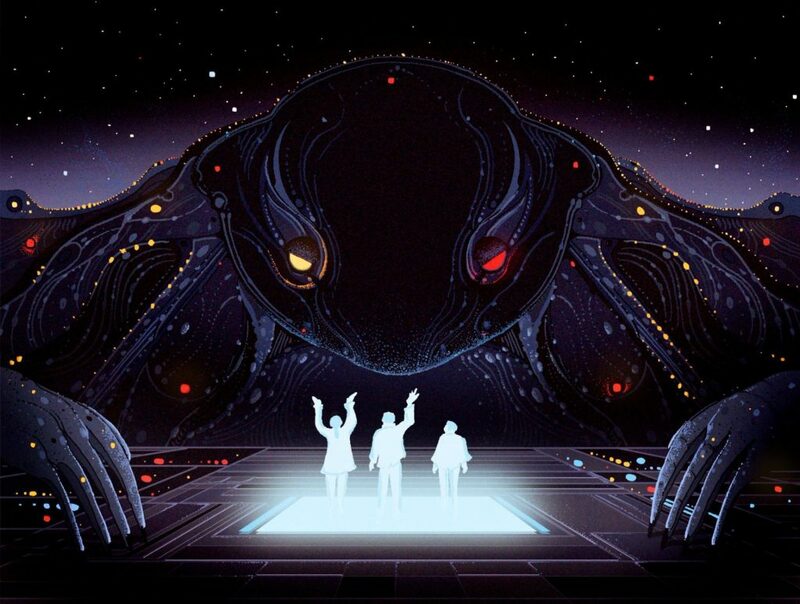 Though I won’t claim to know the future, I suspect that the human condition will be dramatically changed by the year 46,000CE in ways that we cannot yet conceptualize or understand but which may prepare us for encounters with extraterrestrials. However, in the case of Shostak’s METI initiative, the goal seems to be to send messages to the nearest star systems. Gertz and others have shown why this is at best pointless or at worst very dangerous, but to compound the problems, as Gertz’s points out, there is no observing plan for follow-up at some time in the future equal to twice the light travel time when we could soonest expect a reply. This combined with all the other problems associated with being the first to transmit compels me to condemn the METI initiative, at least as it is currently formulated and for the near term future. John Gertz (yes, that Gertz), like any producer worth his salt, is waiting to savor the schadenfreude from the failure of any messaging to extraterrestrial intelligence (METI) efforts. In his recent review, he excoriates METI as “unwise, unscientific, potentially catastrophic, and unethical”. Gertz, a former chairman of the board of the SETI Institute, delivers a myopic view of METI and attempts to separate its goals from those of SETI. His review comes at a politically pointed time for SETI, where Douglas Vakoch and Seth Shostak sought to initiate immediate high power radio transmissions towards our nearest neighbors but were denied by the SETI Institute. It is a calculated attempt to delegitimize METI as science in an effort to curtail any of its progression. Gertz initially poses the question: “[d]o space aliens present a clear and present danger and, if so, is there anything we can do about it?” It is a question worth mulling over, but as it is impossible to quantify unless we make conclusions on fictitious arguments, should not be fatal for METI. He then proceeds to discuss the arguments against SETI. Gertz claims technological benefits accrued from Moore’s Law and should be much more efficient than the past five decades. He ignored the fact that these same advances trickle down to any proposed METI experiment. He notes “funding situation suddenly and dramatically improved when in 2015 Yuri Milner’s Breakthrough Foundation announced its pledge of $100 million over ten years” to fund SETI efforts. To this blogger, funding is perhaps what drives most of the criticism of METI. SETI is at a philosophical crossroads where, with no results for the past five decades, people are questioning the efficacy and purpose of SETI. For Gertz, to allow METI to persist and continue observations is to attack SETI and potentially rob it of any valuable funding in the near future. His arguments as to the nature of ETI and its behavior to humanity are fictitious and impossible to quantify (see Figure 1). His considerations of ETI “travel[ing] hundreds or thousands of LYs just to eat us”, launching a “fairly small kinetic projectile” towards us, or appearing as a taunt have no merit. Ergo, such statements should not be included when considering the fate of METI. Gertz also attacks the use of Arecibo for directed messages. He claims passive leakage does not pose an issue and can even be addressed, suggesting “provision[s] for muting the radar during moments when the target occults a nearby star or transits the plane of the Milky Way”. This appears to be a rather slippery slope, as it would suggest not only METI but active scientific research should adopt some form of ethical considerations. This view would also question the validity of optical SETI endeavors which are currently looking for powerful, pulsed emission. For this blogger, the biggest concern is the ahistorical view of SETI. Most of the criticisms against METI: it being unscientific, unwise, and having no methodology, can be and have been applied to SETI. We have read papers by Hart and Tipler that sought to discredit SETI as a waste of money and effort, and this is what Gertz appears to do with METI. Gertz is using the guise of ethics to stymie METI because to attack the objective of METI would be to attack SETI. Gertz wants to relegate METI to pseudoscience and retain SETI as the only feasible approach to determining if ETI exists, particularly given its recent boost in funding. This blogger views SETI and METI in a similar light. Until there is sufficient data to suggest otherwise, it is unwise to consider either a failure. If METI can secure the appropriate funds and communication channels, then it should by all means proceed. METI: What Percentage “Bark”, What Percentage “Bite”? Short for “messaging to extraterrestrial intelligences”, it’s nothing if not extremely enticing. In class last week, we did an Earth-centric exercise about finding a group you know nothing about. Both of our in-class groups immediately jumped to METI as our main strategy. After that exercise, I definitely wished that we could just do METI and see what happens. And, under one condition, I would. 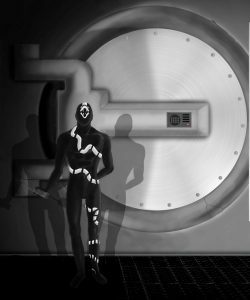 The character Coil from the legendarily long* superhero web-fiction Worm has the power to split the world into two timelines, see how they play out, and collapse the one he doesn’t like as much (he uses this power for evil, of course). If I were Coil, I would 100% try METI, just to see what happens. Because I am not Coil, I can’t just collapse a timeline in which humanity accidentally attracts the attention of something far up the feeding chain (as we expect almost all concurrent intelligences would be). I would prefer not being personally responsible for the extinction of our species, or even (less dramatically) the complete alteration of our future. As a global collective of governments (an idea which seems almost as silly as contacting ETI), perhaps authority could be taken if a decision was reached together. But even so, it’s a decision that has the potential to impact all of humanity, even echoing through generations. So can we ethically make that step, even with a global consensus? Let me take a step back here: I am talking about a “perfect” METI. An isotropic METI signal that is guaranteed to be detected by any intelligent species that it encounters. It’s a philosophical question about an action that will be able to change humanity. As Gertz (2016) argues very sharply, the METI that has been done so far is decidedly not that. Modern METI is more of a publicity stunt with minimal methodology. The focus is often more on the taboo of messaging and the content of the message than on any reasonable way of tackling the problem (not sending a repeat of the signal some time later, for the purpose of scientific reproducibility, and having no plans to listen for a return message are smoking guns for me). One of the more recent communications was a series of songs sent by METI International. The songs weren’t even that good. I am afraid of “perfect” METI. I am not afraid of current METI. But I think that over time, as technology advances and older technology gets cheaper, “perfect” METI will get closer and closer to being a reality. Some preemptive thought toward the issue is probably justified. I wanted to get the opinion of one of my friends, who decided to stay anonymous. My friend is a research analyst at the Open Philanthropy Project and spends a lot of time thinking about how to quantify ethical quandaries and how to maximize the amount of “good” that can be created by given amounts of resources and actions. They shared their ideas about METI with me over text, so their responses have been edited for clarity. I also asked them if they thought that it was possible to construct a cost-benefit calculation to decide if METI was a good idea or not. This was interesting to me, because it seems like it might be possible to try this analysis without falling back on infinite goods and bads. That’s an idea, at least! Any treatment of it could probably produce results on a huge sliding scale a la the Drake equation because of the uncertainties involved, but it would be interesting to at least try to isolate the factors involved. The author provides a very convincing discussion to discredit the arguments most commonly cited in support of METI (i.e., this author is generally opposed to METI efforts.) This paper is somewhat of a “meta” paper, because it discusses SETI/METI at the broadest, most fundamental level. ET may be waiting for us to call – this argument generally falls under the “Zoo Hypothesis.” For a thought-provoking and compelling rebuttal to this hypothesis, see this discussion by Hart. They have most likely already detected our leakage, so we have nothing to hide – if this were true, what would be the point of METI efforts? ET must be altruistic – given the utter lack of any data one way or another, it is premature (and naive) to presume the intentions of an extraterrestrial civilization. ET could not harm us across vast interstellar distances – note the statement that can be taken as all but law: “the only thing we can say about ET with near certainty is that it is more advanced than us” (Gertz). Similar to point 4 above, it is terribly naive to presume the capabilities of a civilization which is almost certainly incomprehensibly more advanced than ours. There is no law against it – Gertz first notes that “legislation often takes time to catch up with morality.” And, while there may be no present laws against it, METI fly in the face of the democratic spirit. Someone has to be the first to transmit – given the “Law of SETI” (Gertz) mentioned above, that any ET is almost certainly more advanced than ours, it seems presumptuous to argue that we, the youngest and least advanced, should be the ones to initiate a dialogue. Gertz additionally raises the point that “once METI signals are sent they can never be recalled” to advise for approaching the decision with healthy caution and hesitance. This article had a strong effect on my personal views – in particular, it shifted my (admittedly naive) stance on METI from generally “what could go wrong, so why does it matter – go for it” to “show me a compelling reason that METI is a good, and responsible, idea.” I agree with all of the counterarguments raised by the author, and agree that they discredit the arguments put forth by METI proponents. This paper leaves me utterly lacking for any compelling reason to pursue METI endeavors. In my opinion, this paper is particularly important, because it highlights the necessity for an united and well-articulated front against METI. One of the enabling factors for METI is the relative lack of organized, influential opposition. (Though Gertz is careful to highlight that such opposition has garnered wide support, especially from some of the relevant leading minds; see, for example, this letter.) The discussion presented in this paper highlights a glaring absence of a compelling argument for a pro-METI approach, if such an approach is to be pursued. Lacking such an argument, it seems that the only conclusion regarding METI can be best summarized by the general sentiment put forth by Gertz: that METI is, at best, a waste of time and resources, and, at worst, outright dangerous. The “water hole,” as used in SETI, has nothing to do with holes and only a little to do with water (but not really). It is the range of frequencies between 1420 and 1700 MHz, bounded by the hydrogen line and the hydroxl line (H + OH -> H2O, so sort of related to water but unrelated still to holes). The idea of this water hole was first introduced in 1971 by the Cyclops study who suggested that this band was a place where “different galactic species might meet” just as animals meet at actual water holes. In an attempt to resurface love for the “Water Hole,” Oliver wrote his paper “Rationale for the water hole” in 1979. This publication was timely in that many companies were submitting proposals and plans to fill this frequency band with what would be interference to astronomers searching for ETI. Oliver suggests (and I agree) that “it would be a bitter irony if the desire to know exactly where we are … were to prevent us from ever knowing where we are with respect to other life,” as many of these proposed technologies were for GPS. Oliver writes his paper methodically, going over requirements for any signal from ETI and arguing for the water hole. First, any signal sent must be significant in respect to signal to noise. Oliver immediately dismisses Bracewell’s probes as excessive and expensive. Therefore, the signal must exceed the noise, avoid scattering and deflection by the ISM and other mediums, and be easy to detect. Massive particles are excluded from this as they require too much energy to send and anything holding a charge would be deflected or absorbed. Although neutrinos are nearly massless, they cannot be generated or detected easily and are not usually radiated by civilizations, so no one would start by looking there. In contrast to all of this, light is massless and easy to produce and detect. Low energy photons are also not readily absorbed or deflected, making them a great signal. Oliver argues for the microwave region as the optimal region since it gives the minimum detectable received power, and grants the smallest cost per unit of collecting area. It also allows for bandwidths narrower than optical. This region is also decently unobscured by the Earth’s atmosphere. Obviously, we need to be able to detect signals through our atmosphere, but the signal would need to leave the atmosphere of other civilizations (assuming their life and atmosphere are alike to ours). The H and OH lines are also relatively quiet in respect to the receiver noise per channel. All of this leaves a fairly wide band (2GHz), which is way too wide to search. And thus enters the water argument. Life on our Earth requires water, and water is decently common in the universe. It isn’t too difficult to take these two facts and postulate that most life in the universe probably requires water. So, searching for signals of water make sense. Why that means that the H and OH lines should be the borders of the band we search in, I’m not sure. I suppose the H and OH lines leave a decent sized band that is an appropriate place to search. Since no better band has been suggested, Oliver argues that this band should be used for SETI and preserved for such reasons. He closes with a lovely quote “If we are to make progress we must proceed on the basis of what we know, and not forever wait for something now unknown to be discovered” that should be on scientific motivational posters. I personally really enjoy this paper since it is methodical, scientific, and not just random, unsupported postulation. As of now, I’m not sure if the water hole is bogged down with terrestrial signals, but I hope not. I wonder if a call to action (or I supposed inaction) such as Oliver’s need be published every few years to remind people of why it is important. Something to look into. 1420 MHz: The interstellar water[ing] hole? In this 1979 article, Bernard M. Oliver (1916 – 1995) builds up on the suggestion of Cocconi and Morrison (1959), and the work of the Cyclops study (Oliver and Billingham, 1973) to suggest that the region bound by the Hydrogen and Hydroxl lines (1420 – 1660 MHz) should be the prime frequency band for our search for extra – terrestrial intelligence. This region bounded by the ‘water’ band, has since been called the water hole, an allusion to a watering hole. Oliver starts off by my making the case for electromagnetic (EM) waves are the most practical (fastest and most energy efficient) way to interact with extra-terrestrial civilizations under the current technological limitations. This is mainly due to their zero mass, and travel speed (celeritas). Then, estimating the noise contribution from the non thermal background, and the cosmic microwave background (CMB) radiation, and collating that with the absorption features (mainly the water molecules in the atmosphere), he concludes that the ~ 1 GHz to ~ 10 GHz window is the preferred spectrum for us to search for ET signals. Citing the Cyclops study, he concludes that the region between Hydrogen and Hydroxl ions would be the best band to look at it, due to the significance of water for harbouring life. Is this really the best place to look in? He does go on to question whether such an argument is being too ‘chauvinistic’ and anthropomorphic. Considering that life on Earth is the only example we have for life, I feel that this is a reasonable place to start looking in. Due to the above, he strongly recommends that this waterhole must be protected from any terrestrial interference and noise. I think this paper was assigned to us to understand the details associated with choosing this particular radio band, as the preferred means of communication and search, and its significance. It is important to understand the historical and scientific background for today’s SETI searches looking for extraterrestrial intelligence around this interstellar watering hole. A Simple Request: Stop polluting my waterhole! This blogger does not intend to use humor to diminish the impact of water pollution or the need for water conservation – keep water clean (just don’t drink it raw)! 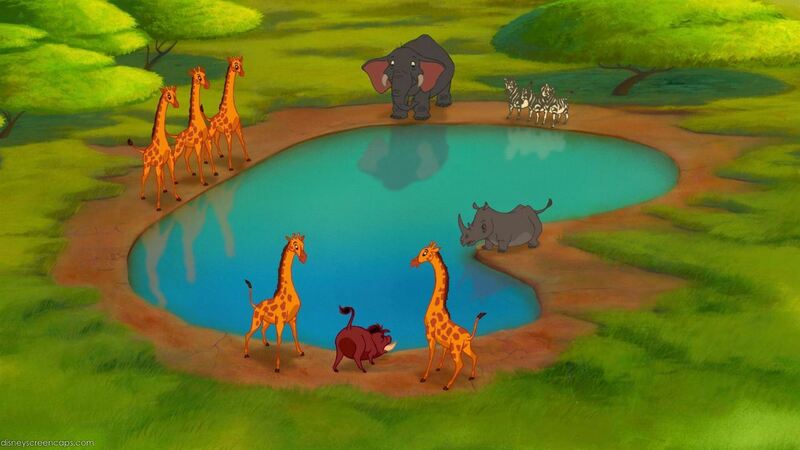 Animals socialize at the waterhole and require one without pollution (see Figure 1). In his 1979 paper, Bernard Oliver argued advanced societies might do the same. In this case, the “waterhole” meant a relatively quiet region of the electromagnetic spectrum and “pollution” referred to noise and interference from satellites and other man-made objects. The waterhole is defined by the Cyclops team as the region bounded at the low end by the hydrogen line (at 1420 MHz) and at the high end by the hydroxyl lines (~1662 MHz) (see Figure 2). It is this region, Oliver argues, that should be thoroughly searched for interstellar signals. Oliver can be considered a conservationist of sorts, as he makes a political plea to retain the lack of navigational satellites and other systems operating within this band and provides a logical argument for it. The premise for this policy decision is that any advanced society with a desire to communicate will choose the least expensive means to communicate. normally be radiated by technological civilizations. Any particle with mass is an unlikely candidate as it requires a lot of radiated power to be generated. Charged particles are ignored due to absorption and deflection while neutrinos are difficult to generate and detect. Ergo, photons are our best means of communication. Oliver then describes which region of the electromagnetic spectrum should be used. He considers the detected signal/noise power ratio (DSNR). The DSNR has contributions from galactic noise and the relic cosmic background (see Figure 2). He also considers the terrestrial microwave window. When taken together, the quietest part of the spectrum is the waterhole. These are small steps but at least some credence is given to SETI with regards to policy. To this blogger, the importance is the collection of data and science that can be performed. While we have yet to meet another society at the waterhole, it is important to continue to search before relegating SETI to the same level of pseudoscience as alchemy.